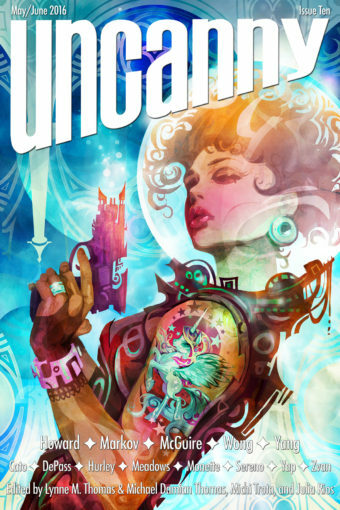 Welcome to Uncanny Magazine Issue Ten! All of the content will be available for purchase as an eBook (PDF, EPUB, MOBI) on May 3, 2016. The free online content will be released in 2 stages—half on May 3, and half on June 7. Featuring all–new short fiction by Seanan McGuire, Kat Howard, JY Yang, Alyssa Wong, and Haralambi Markov, reprint fiction by Kameron Hurley, nonfiction by Foz Meadows, Tanya DePass, Sarah Monette, and Stephanie Zvan, poems by Beth Cato, M Sereno, and Isabel Yap, interviews with Kat Howard and Alyssa Wong, and Galen Dara’s “Bubbles and Blast Off” on the cover. Episode 10A (May 3): Editors’ Introduction, Seanan McGuire’s “Ye Highlands and Ye Lowlands” (as read by Amal El–Mohtar), Beth Cato’s “Deeper Than Pie” (as read by Erika Ensign), and an interview with Seanan McGuire conducted by Deborah Stanish. Episode 10B (June 7): Editors’ Introduction, Haralambi Markov’s “The Drowning Line” (as read by Heath Miller), Isabel Yap’s “Alamat” (as read by Erika Ensign), and an interview conducted by Deborah Stanish. Galen Dara likes monsters, mystics, and dead things. 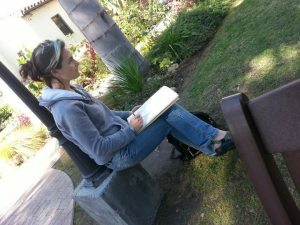 She has created art for Escape Artists, Uncanny Magazine, 47North Publishing, Skyscape Publishing, Fantasy Flight Games, Tyche Books, Fireside Magazine, and Lightspeed Magazine. She has been nominated for the Hugo, the World Fantasy Award, and the Chesley Award. When Galen is not working on a project you can find her on the edge of the Sonoran Desert, climbing mountains and hanging out with a friendly conglomeration of human and animal companions. Her website is www.galendara.com. You can follow her on Facebook, Instagram and Twitter @galendara.